Professional Images and Fast Performance in one camera. As of June 2015, the SX60 has the second longest zoom on the market, with a range of 21-1365mm equivalent. The lens is quite a bit wider than on most superzooms, which typically start at 24mm. The camera’s 3″ LCD can flip to the side and rotate a total of 270 degrees – handy for both video and overhead shots. The resolution of the display is 922k dots, which is the best you’ll find in this class. The SX60 has a small 0.2″ electronic viewfinder with 922k dots. While the resolution is very good, the ‘field sequential’ technology it uses can cause ‘rainbow color tearing’ which some people may find unappealing. A rare feature on consumer superzooms, the hot shoe can add a more powerful flash that can also be used to wirelessly control off-camera Speedlites. The PowerShot SX60 HS camera employs a 16.1 Megapixel CMOS sensor. Utilizing a sophisticated light-capturing design, it provides high sensitivity for improved high ISO capture with reduced noise. It is also a high-speed design, capable of rapidly capturing and moving image data to the processor, enabling faster continuous shooting and faster autofocus. The camera is equipped with the DIGIC 6 Image Processor, which makes several important advancements to image quality both in stills and video. Improved light sensitivity allows for higher resolution with less noise when shooting in dark conditions, and Dynamic IS now detects and compensates for tilt and parallel movement (shift blur) to create video that’s exceptionally free of distortion. The DIGIC 6 Image Processor also enhances the performance capabilities, powering full resolution high-speed continuous stills shooting. With the Canon HS SYSTEM, you’ll experience excellent tracking performance even in low light, and achieve gorgeous still image quality even at high ISO speeds all the way up to ISO 3200; beautiful low-light shots are possible with minimal noise and maximum detail in highlight and shadow areas. The Canon HS SYSTEM lets you use higher shutter speeds to capture clearer images with reduced noise and blur in a variety of situations for incredible photos, even when shooting video. The camera’s astonishing 65x Optical Zoom (21mm-1365mm) Wide-Angle Lens with Optical Image Stabilizer combines tremendous flexibility with portable ease. Capture close-ups, wide shots and everything in between with beautiful quality thanks to a 16.1 Megapixel* High-Sensitivity CMOS Sensor and Canon’s latest DIGIC 6 Image Processor that together create the Canon HS SYSTEM for excellent low-light performance. Advanced technology including Zoom Framing Assist and Intelligent IS help you track and capture clear, steady long shots. Shoot realistic 1080p Full HD video recorded at 60p. USM and VCM technology help ensure fast, silent zooming and focus during recording, and, in a first for a PowerShot model, you can attach an optional external microphone. And quickly share everything you capture: the PowerShot SX60 HS is Wi-Fi®**- and NFC-enabled*** with an easy Mobile Device Connect button. With the PowerShot SX60 HS camera, you’ll preserve memories and creative film clips in beautifully realistic 1080p Full HD Video at 60 frames per second. Simply press the dedicated Movie button to begin recording. And now for the first time on a PowerShot model, a new input allows you to attach an optional external microphone (3.5mm diameter) for serious audio recording to match the high-quality video you’ll capture. The camera’s powerful zoom is equipped with Canon’s precision-engineered Ultrasonic Motor (USM) and Voice Coil Motor (VCM) for fast, silent zooming and focus that won’t interfere with audio capture. The PowerShot SX60 HS camera supports NFC (Near Field Communication) technology, eliminating the need to manually find and open the Canon CameraWindow app# on your mobile device. Simply touch the NFC icon on your camera to your compatible Android™ device##, and the CameraWindow app will launch automatically for quick, easy sharing of your images. Built-in NFC technology also makes it simpler to install the app.
. The system automatically analyzes camera movement and applies the best shake correction method for the shooting situation allowing you to focus on framing and capturing your shot. For stills, the system selects from Normal IS, Panning IS, Macro (Hybrid) IS and Tripod modes. When shooting video, the system selects from Dynamic IS, Powered IS, Macro (Hybrid) IS and Active Tripod IS modes. 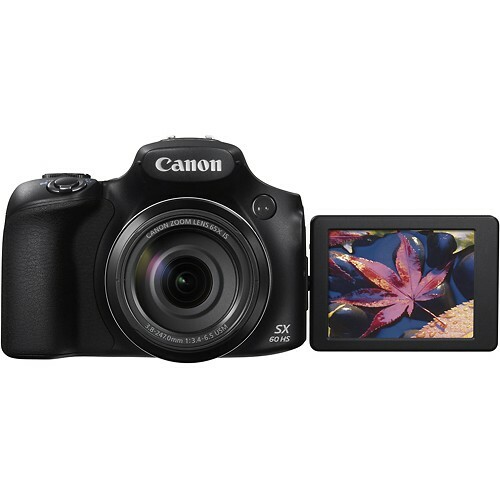 The Canon PowerShot SX60 HS is the ‘safe bet’ in the superzoom category. 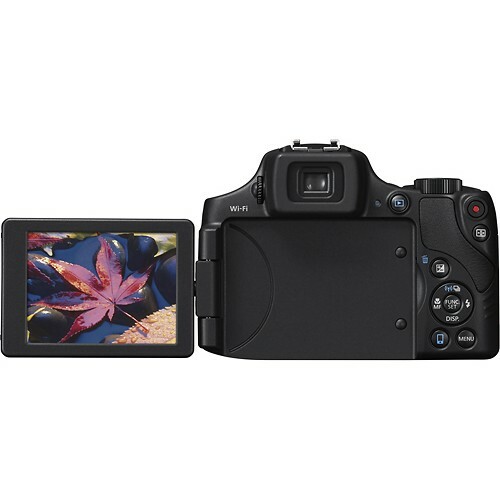 It offers good image quality, a fully articulating LCD, more than enough zoom power, and a solid feature set that includes Raw support, advanced video functionality, and a hot shoe. *Using an 8 GB, UHS-I compatible memory card that meets Canon’s testing standards. The number of shots changes depending on subjects, brands of memory cards, etc. Shooting in RAW (including RAW+JPEG) is excluded. 8GB 26 min. 22 sec. 10 hrs. 42 min. 58 sec. 20 hrs. 34 min. 24 sec. 38 hrs. 15 min. 35 sec. 26 hrs. 45 min. 37 sec. 48 hrs. 27 min. 58 sec. 82 hrs. 18 min. 04 sec. 1 hr. 27 min. 00 sec. 2 hr. 07 min. 47 sec. 32GB 1 hr. 46 min. 33 sec. 43 hrs. 17 min. 23 sec. 83 hrs. 06 min. 30 sec. 154 hrs. 33 min. 09 sec. 108 hrs. 05 min. 38 sec. 195 hrs. 46 min. 14 sec. 332 hrs. 26 min. 26 sec. 5 hr. 51 min. 26 sec. 8 hr. 36 min. 11 sec. Note: 30 display languages provided (English, German, French, Dutch, Danish, Finnish, Italian, Norwegian, Swedish, Spanish, Simplified/Traditional Chinese, Japanese, Russian, Portuguese, Korean, Greek, Polish, Czech, Hungarian, Turkish, Thai, Arabic, Romanian, Ukrainian, Farsi, Hindi, Malaysian, Indonesian, Vietnamese). All data are based on Canon’s Standard Test Method. Subject to change without notice. Canon, DIGIC, ELPH, PIXMA, and PowerShot and SELPHY are registered trademarks of Canon Inc. in the United States and may also be registered trademarks or trademarks in other countries. Microsoft, Windows and Windows Vista are trademarks or registered trademarks of Microsoft Corporation in the United States and/or other countries. Mac is a trademark of Apple, Inc., registered in the United States and other countries. All other products and brand names are registered trademarks, trademarks or service marks of their respective owners in the United States and/or other countries.